Numerous applications exist that require moving an object (i.e. 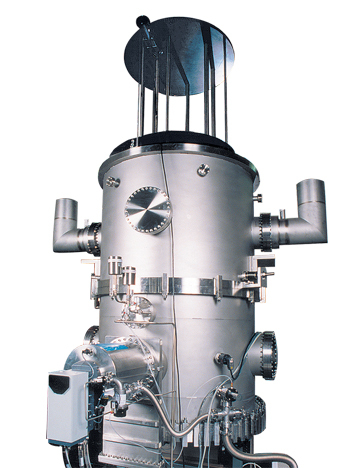 a wafer, disk, or target) within an ultra-high vacuum (UHV) system. Typically samples will be transferred in the linear direction between chambers or from a loadlock into a chamber. Rotation or other manipulation may also be required. The wide range of motions of the standard line of UHV Transfer Precision Magnetic Manipulators fill many of these needs. However in response to customer requests for unique applications, UHV Transfer has modified and continues to develop transporters and devices to perform specific tasks. Variations include high force manipulators, multiple shafts, hollow or solid shafts, and unique shaft materials,and lengths. A few customized manipulators are shown below. A series of positioning devices were required to be used on an optical system in a controlled environment. The system is pumped down and then backfilled with a gas. A laser beam is sent through a viewport on the front end of the system. The positioning devices allow for lens to be moved into the line of the beam and withdrawn as required. Six pneumatically driven Model DBLOM manipulators with adjustable dampers and flow controllers for adjustability of location and speeds were provided. Miniature, lube free, ceramic ball, hybrid bearings were used for zero outgassing of hydrocarbon lubricants of particulate generation due to UHV dry films. These PMMs replaced existing bellows manipulators from another manufacturer. The user found that material outgassing from the bellows manipulators was contaminating the lens causing problems with experiments. A transfer mechanism and manipulator system was needed to deliver a wafer into a furnace and rotate continuously at a preset speed. The process required the internal rod to be fabricated of quartz. A Model DBLRM, Precision Magnetic Manipulator with a quartz shaft is stepper motor driven via a keypad HMI (Human Machine Interface). This manipulator is mounted vertically and a platter will be mounted to the end of the shaft. A wafer is loaded onto this platter and delivered upward into a furnace. While in the furnace the wafer is rotated continuously at a preset speed. The unit is equipped with optical limit switches for home and the HMI that can be programmed by the user to change many different operational parameters (i.e., delivery distance, rotational speed, etc.). 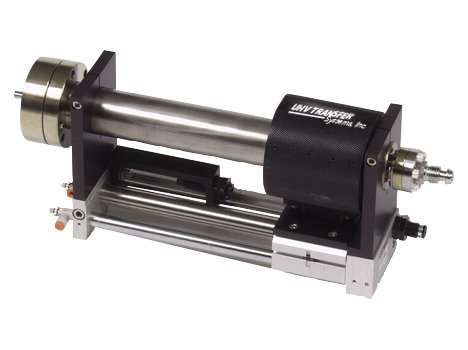 A manufacturer of thin film deposition tools was looking to replace a bellows-based, dual rotary, UHV manipulator from another supplier with a UHV, magnetically-coupled manipulator. The application is for indexing and rotating PLD targets in a Physical Vapor Deposition system. Motor mounts and couplings were required for installation of customers motors. 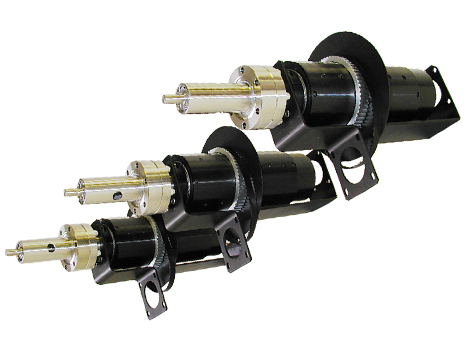 Dual Rotational Hollow-shaft, Magnetically-coupled manipulators have been provided. 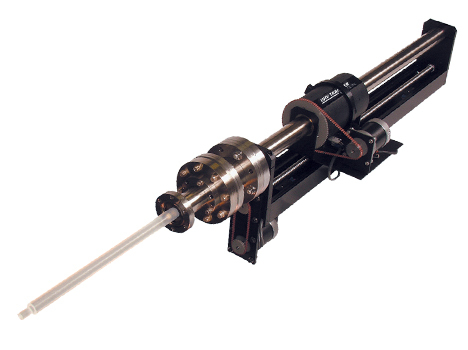 Units with a wide variety of rotating tube and inner shaft diameters and shaft extension lengths meet each system requirement. The ultimate goal of this project was to allow the users to study materials which had been introduced and frozen onto plates at liquid nitrogen temperatures (77k). In order to do this, gases would be introduced into the vacuum system which would freeze onto the plates. A second chamber within the vacuum system, which was also cooled, would then be lowered to separate the vacuum system into two distinct volumes. The materials trapped on the plates would then be studied as the temperature of the plates was raised. The material being studied was radioactive, therefore, the customer did not want to use welded bellows (which could rupture) or any other vacuum seals with a potential to leak. Heavy duty magnetic manipulators were developed to allow the large inner shroud to be positioned within the vacuum system. Six of these manipulators were used, each with a coupling force of 180 lbs. They are driven up and down with a large motor, leadscrew drive mechanism and a simple motion control system.